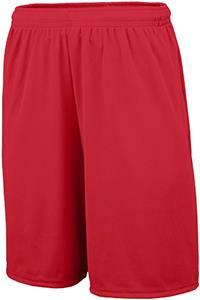 Augusta Sportswear Training Shorts with Pockets. 100% polyester wicking knit. Wicks moisture away from the body. Full-cut. Heat sealed label. Covered elastic waistband with inside drawcord. Side seam pockets. Adult 9-inch inseam/Youth inseam graded. Double-needle hemmed bottom. Waist (on half) 12" 13" 14" 15" 16" 17"
Hip (on half) 21.25" 23.25" 25.25" 27.25" 29.25" 31.25"
Waist (on half 10.75" 11.25" 11.75"
Hip (on half) 16.75" 18.75" 20.75"